What is your favorite start-up company/founder? I dig CEO’s that have worked hard by building their company through hard work. Elbow grease goes along way. I like innovators. While he was a known to be difficult, I love Steve Jobs. Jeff Bezos from Amazon is amazing. I’ve also been fortunate to have some challenging bosses and CEO’s throughout my career in sales prior to Rounded Digital. What is an app you can’t live without? I’m always in love with the newest tech hardware. I can’t pick my favorite. Airbudz, iPhone, MacBook Air, Apple Watch, and my Alexa Show are all used very frequently. What are some tech/digital tools you recommend? Personal mantra or favorite quote? I often discuss Gary Vaynerchuk and his Macro-patience and Micro-speed concept. Justin was born in Columbus, Mississippi and lived in Charlotte, North Carolina until he was 9 years old, before moving to Grand Junction, Colorado. He was an avid athlete, playing football and basketball in high school, paired with a love for skiing in the beautiful Colorado mountains. Justin migrated to several cities around Colorado before attending CU Boulder where he discovered two of his greatest passions, fitness and music. He began to pursue a career as a personal trainer and competed in bodybuilding competitions, finding fulfillment in an active lifestyle. He soon picked up playing guitar and his undeniable charisma made him the obvious choice as the lead singer of the popular touring band, Left Foot Green, from 2006-2012. Navigating the music industry taught Justin many of the business dynamics he carried over into his role in founding Rounded Digital. He got his feet wet in the marketing world by designing a press kit then cold calling venues to book shows and negotiate compensation. With a powerful presence that just can’t be ignored, he was wildly successful in contacting local magazines, radio stations, and news broadcasters to promote his concerts. Rinse and repeat. His organic business savvy lead him to digital marketing, he found himself in a role at a top marketing agency where he won a handful of sales awards and was named “Employee of the Year”. In 2016 Justin founded Rounded Digital on the premise that marketing is lead generation, marketing is real engagement, with real people, and that marketing is sales. Described by his colleagues as a “tornado entering the room”, Justin’s robust personality and infectious laughter add character to the Rounded Team, where his role is constantly evolving. 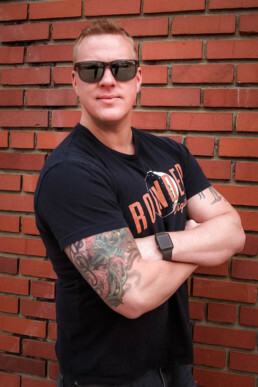 His main focus is business development and identifying potential clients that he knows would benefit from Rounded’s unique marketing approach. When he isn’t explaining the importance of an online presence to companies, Justin is known for lifting morale with a good joke or impromptu song.